I can’t remember the last time I made scones. I think it was about 3 years ago, when I brought them to a potluck at work. I do remember that everyone was asking me for the recipe! 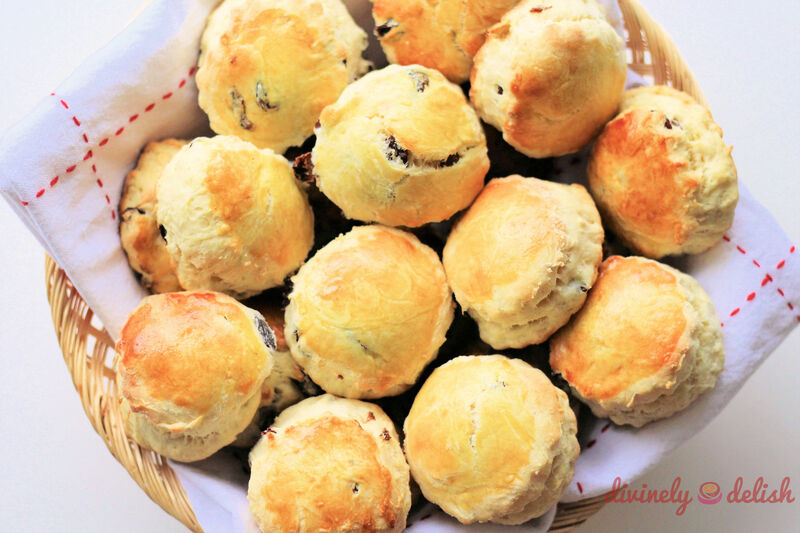 Recently, I was really wanting to have some of my raisin scones again. I think the craving started when I found some buttermilk powder that I’d bought a while ago and forgotten about. I decided to mix it with some water to rehydrate it, and then I had to figure out what to do with it. 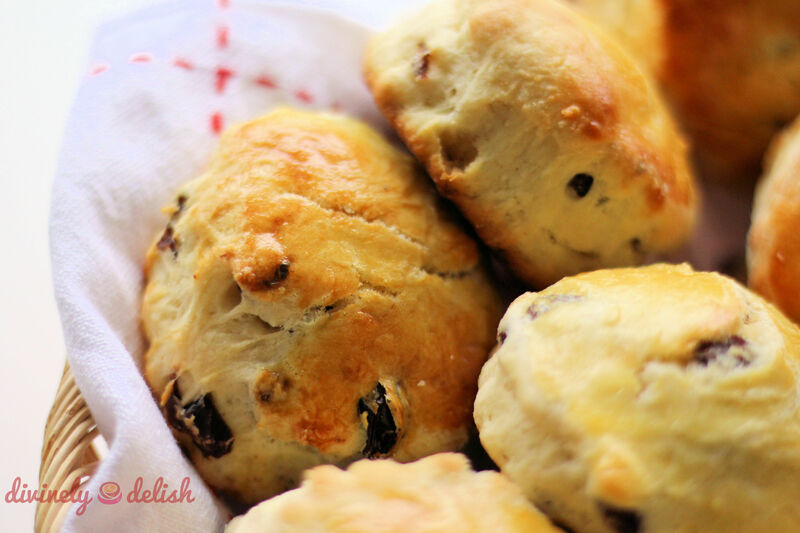 Just when I’d decided on making raisin scones, I came across a recipe for Bacon and Chive scones and considered making these savoury scones instead. But no, I just had to make both kinds, so I spent the better part of this past Sunday baking a lot of scones! Scones, like muffins, banana bread or soda bread, are considered quick breads. They do not require use of yeast as a leavening agent (unlike traditional breads). They rely instead on the use of chemical leavening agents, such as baking powder or baking soda. So they are much easier to make and less time-consuming! I usually only use butter, but you can also substitute part of the butter with lard, for extra flakiness. Instead of raisins, you can add in whatever you desire. If using raisins or other dried fruit such as currants or cranberries, I would suggest that you first soak the fruit in a bowl of hot water for about 10 minutes, and then strain it. This helps to soften and plump up the dried fruit, and makes them juicier, in addition to preventing the fruit from drawing moisture from the batter. 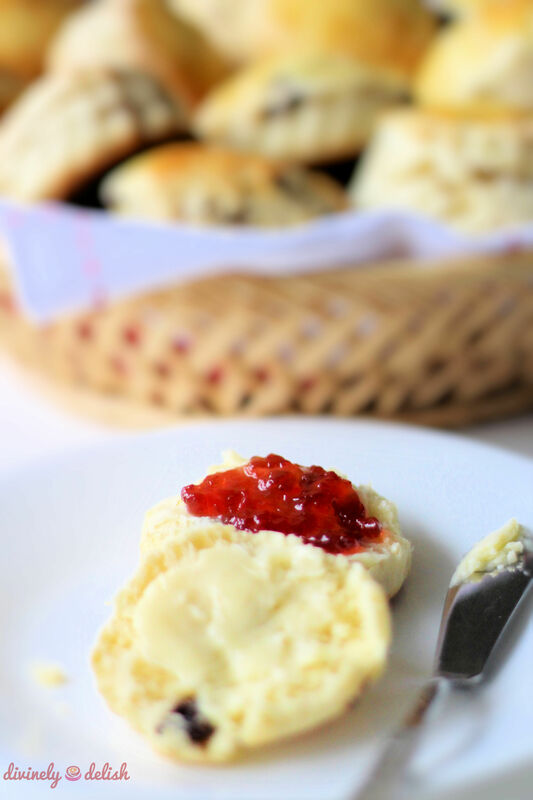 Scones are the quintessential British tea time treat, traditionally served with clotted cream and jam. They’re best eaten warm. I like to enjoy mine with butter and strawberry or raspberry jam. This time however, I had just finished my strawberry jam, so I spread on some Sangria Jelly (jam). Sound yummy? Oh, it was divine! 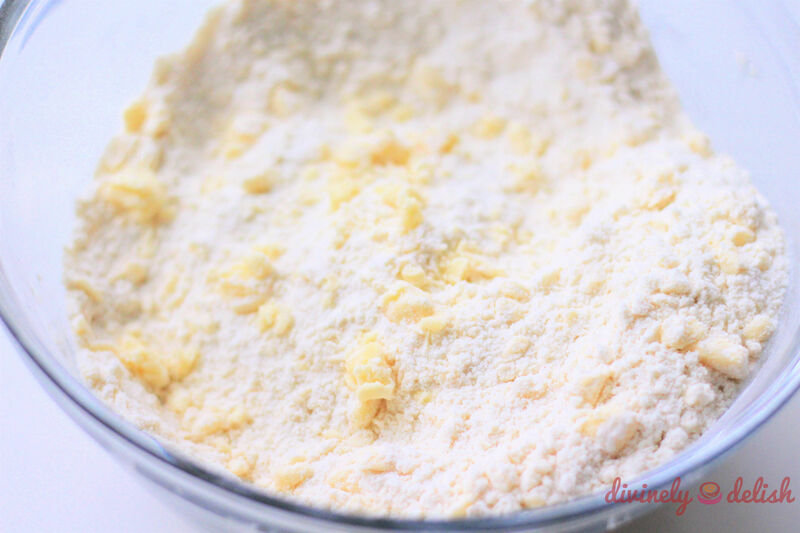 Mix the chunks of cold butter into the mixture of dry ingredients by using a pastry blender or use your fingertips to rub in the butter until you get pea-sized lumps. Make a well in the centre, and pour in the mixture of wet ingredients. Gently mix the ingredients until just blended. Do not overwork the dough. Dust your hands and the working surface with additional flour. Pat down the dough to about a 5/8″ (1.5 cm) thickness and use a round smooth-edged or fluted biscuit cutter (I used a 2-1/4″ / 58 mm diameter cutter) to cut out the scones. Flip them over and place on a parchment-lined baking sheet. It’s not May 30 yet, but I’m celebrating National Scone Day early. 🙂 Enjoy these and watch out for my upcoming post on Bacon, Chorizo and Chive Scones! 1) Preheat oven to 425F. Line a baking sheet with parchment paper. 2) In a large bowl, sift the dry ingredients together (flour, sugar, salt, baking powder). 3) Using your fingertips, rub the butter into the dry ingredients until they are pea-sized lumps. Alternatively, use a pastry blender to cut in the butter. 4) In another bowl, whisk together the eggs and buttermilk. 5) Make a well in the centre of the dry ingredients and pour in the wet ingredient mixture. 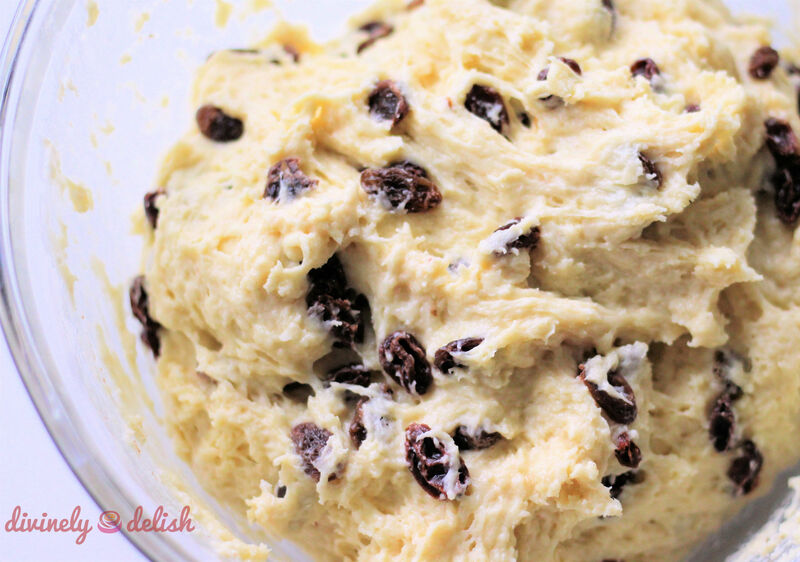 6) Gently fold the dry ingredients into the liquid, add in the raisins and continue blending until it’s just mixed. Do not overwork the dough. 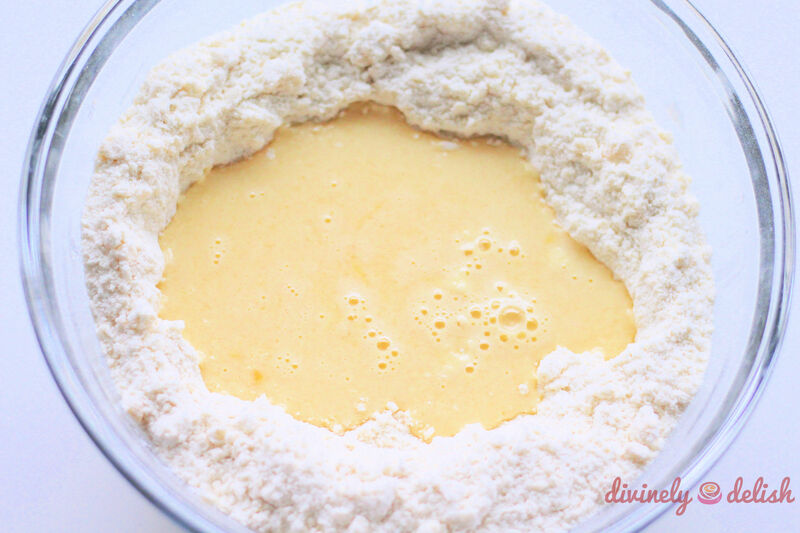 7) Transfer the dough to a floured surface. 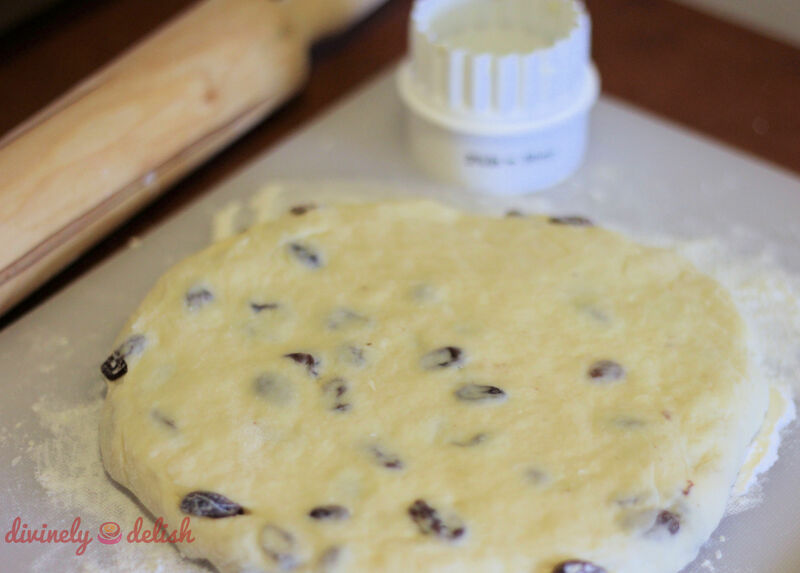 Dust your hands with flour and pat down the dough until it’s about 5/8″ (1.5 cm) thick. 8) Dip a round 2″ to 3″ smooth-edged or fluted pastry cutter into some flour (I used a 2-1/4″ or 58 mm diameter cutter), and cut out the dough. 9) Turn dough pieces over (upside down) and place on baking sheet. 10) Brush the tops with the egg wash.
11) Bake for 13 to 15 minutes, or until scones are well-risen and a light golden colour. 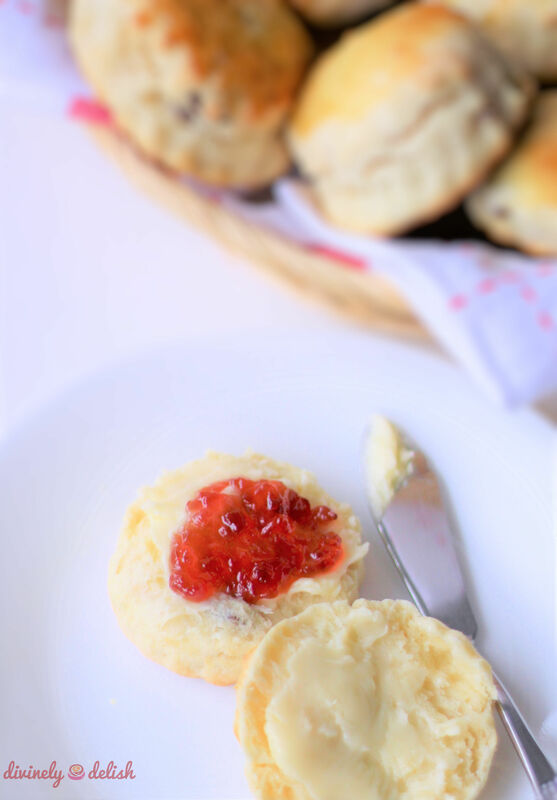 Note: Scones are best eaten when they are freshly baked and still warm. However, they also freeze well, both the dough and the finished product. 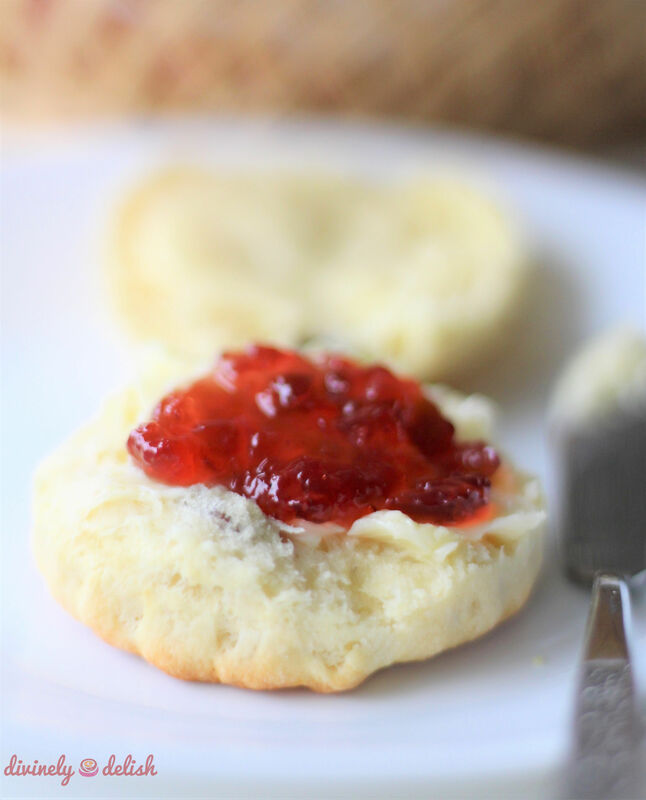 Freezing unbaked scones: Unbaked scones can be kept in the freezer for up to 3 months. After the dough has been cut out, place the pieces on a baking sheet and put the whole tray into the freezer for a couple of hours. Once the pieces are frozen, place them into a freezer bag or airtight container. There’s no need to thaw them. Just bake them as you would normally, although they may need an additional couple of minutes in the oven. 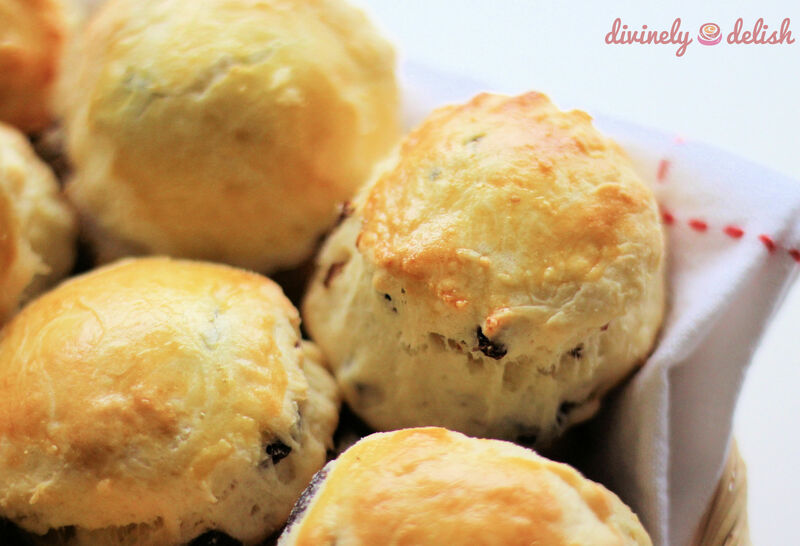 Freezing baked scones: Baked scones can be kept in the freezer for up to a month. 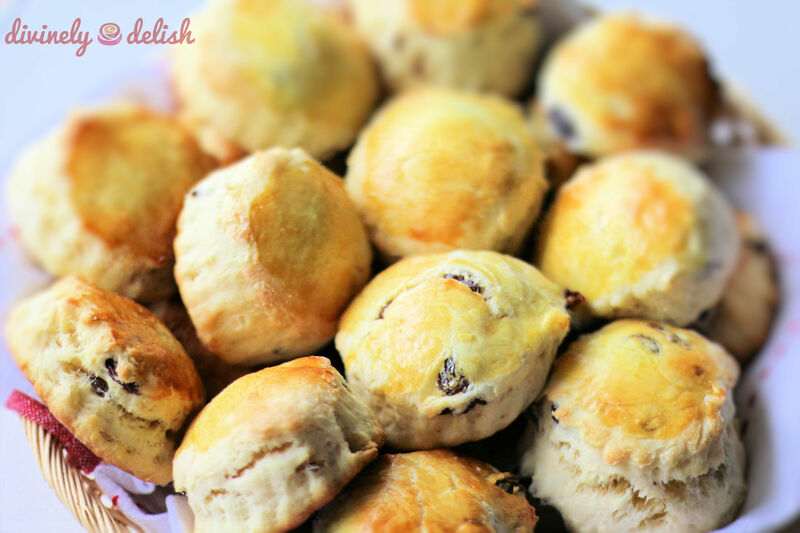 Allow the scones to cool completely before placing them in a freezer bag or airtight container. You may also want to place a sheet of wax paper between the scones to prevent them from sticking together. Thaw the scones at room temperature for about an hour. Then heat them up in a 300F preheated oven for 5 to 10 minutes.